A whiplash injury can occur during a motor vehicle accident, a ride on the dodgem cars, or even a jump on the trampoline, your body changes directions suddenly. A whiplash injury is when the head moves forward, then snaps backwards suddenly. A whiplash injury can cause damage to the muscles, ligaments and tendons that support the head, causing a pinched nerve in the neck. Chiropractic care may include the following. Due to the complicated nature and profound impact on peoples lives due to whiplash symptoms, few topics in health care generate as much controversy as whiplash injuries. Unlike a broken bone where a simple x-ray can validate the presence of the fracture and standards of care can direct a health care professional as to the best way in which to handle the injury, whiplash injuries involve an unpredictable combination of nervous system, muscles joints and connective tissue disruption that is not simple to diagnose and can be even more of a challenge to treat. In order to help you understand the nature of whiplash injuries and how they should be treated, it is necessary to spend a bit of time discussing the mechanics of how whiplash injuries occur. During a rear-end car collision, your body goes through an extremely rapid and intense acceleration and deceleration. 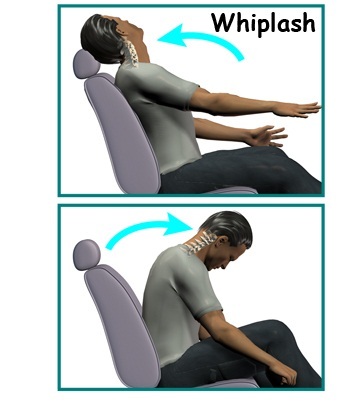 In fact, all four phases of a whiplash injury occur in less than one-half of a second! At each phase, there is a different force acting on the body that contributes to the overall injury, and with such a sudden and forceful movement, damage to the vertebrae, nerves, discs, muscles, and ligaments of your neck and spine can be substantial. Facet joint pain is the most common cause of neck pain following a car accident. Facet joint pain is usually felt on the back of the neck, just to the right or left of centre, and is usually tender to the touch. Facet joint pain cannot be visualized on x-rays or MRIs. It can only be diagnosed by physical palpation of the area. A less common, but very debilitating disorder that results from whiplash is temporomandibular joint dysfunction (TMJ). TMJ/ jaw pain usually begins as pain, clicking and popping noises in the jaw during movement. If not properly evaluated and treated, TMJ problems can continue to worsen and lead to headaches, facial pain, ear pain and difficulty eating. Many chiropractors are specially trained to treat TMJ problems, or can refer you to a TMJ specialist. Many mild whiplash injuries heal within six to nine months with the correct Whiplash treatment. However, more than 20% of those who suffer from whiplash injuries continue to suffer from pain, weakness or restricted movement two years after their accident. Unfortunately, the vast majority of these people will continue to suffer from some level of disability or pain for many years after that, if not for the rest of their lives.